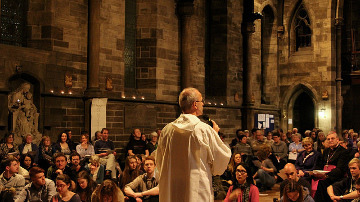 A brother of the Community was in Edinburgh for the weekend on the theme of the 2015 anniversaries at Taizé. 300 people gathered in Old St Paul’s Church in the city-centre for the evening prayer which was the main event of the weekend in Edinburgh. Participants had come from all over Scotland, including the islands of Tiree and Arran. Seventeen of the members of the choir of St Mirin’s Cathedral, Paisley, came to add their voices to those of the music group who had had several practices prior to the weekend. A number of participants had come from different parts of England, one person from as far away as Portsmouth. 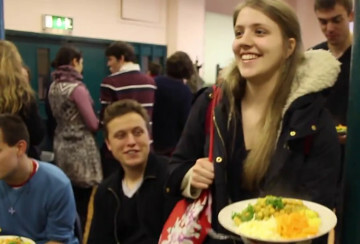 Just in time to catch a quick supper before the prayer, 8 students from Sunderland arrived, brought by their chaplain. It was 3 hours drive to come and 3 hours back, and their chaplain, Chris, had to preach the next morning, so sadly they could not stay for the ceilidh at the end. Next time they will certainly stay overnight as many others did, including the 3 young people who came directly from Poland for the weekend. We were joined for the prayer by the Right Reverend Lorna Hood, Moderator of the General Assembly of the Church of Scotland and by the Most Rev. Leo Cushley, Archbishop of St Andrews and Edinburgh. Both of them prayed intercessions for peace and unity. The archbishop, taking his cue from the music group who had sung the first few intercessions, sang his out, completely in tune! God our Father, give us a longing for the visible unity of the Church: gather us and renew the communion among Christians, so the world may believe in your love, we pray to you. God our creator, you have placed in us an infinite desire. For Christians and for the believers of all religions, we call down your blessing: may we meet one another in the doing of good, we pray to you. Taylor, one of the participants in the weekend has published this short reflection on the meeting and the evening prayer on the SCM website. Elin has posted a number of her photos here. • Soo Tian, Oxford: living with asylum seekers in a Catholic Worker House. • Aimi, Ingrid, John, Conny: l’Arche, Edinburgh – people with and without learning disabilities share their lives. • Callum, Craigmillar, Edinburgh: Richmond’s Hope is a place which welcomes bereaved children and young people.